Grid Zine Fest gathers—and encourages—creators of handmade publications. Back in the 1990s, when I was in high school, the cool thing for aspiring artist, writers and adolescent intellectuals was to make a zine. You'd craft some art, write an autobiographical story, create some collages—I still have a copy of the zine I made from diary entries documenting the long recovery after I broke my leg—and go down to the local photocopy shop. You'd print out a few pages, bind them with staples or a thread and needle, then drop off your creation at coffee shops around town, and there it was: your self-published work, out there in the world. It felt subversive and new, though it wasn't entirely. Zine origins can be traced back to political pamphlets of the 18th century and sci-fi pulp fanzines of the 1930s. In the '70s, they were part of the punk and feminist movements. 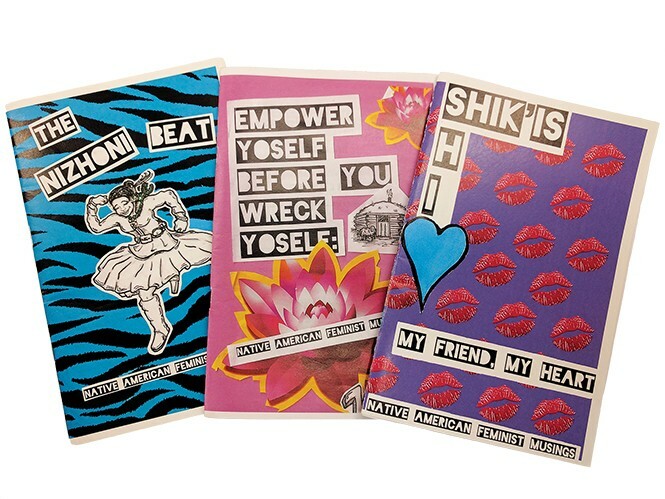 And by the 1990s, even the Salt Lake City Public Library had a healthy and growing collection of handmade zines of all shapes and sizes—from big books to little folded cards—produced by zine-sters all over the United States. Then the internet really took off, and the future of such physical objects looked bleak. Whether a sign of resurgence or proof that zines never died, this Saturday marks the inaugural Grid Zine Fest in Salt Lake City. More than 40 zine makers, many of them local, gather to exhibit and sell their one-of-a-kind creations, while panels and workshops throughout the day provide inspiration and how-to tips for those curious about starting their own. Ella Mendoza—a native of Lima, Peru, now living in SLC, and a talented artist and activist for undocumented immigrants—created her zine series, Resist, as a pocket-sized handbook for undocumented residents. "I've been making art for a few years, but I started making the zines about a year ago after going to a feminist zine fest in New York," Mendoza says. She says her zines are "educational, know-your-rights stuff, like how to interact with police. My favorite has a little person with a blank speech bubble and a black picket sign where you can fill in your own words. It helps prepare you: How are you going to resist?" In addition to bringing her zines to the festival, Mendoza leads a workshop titled "How Our Art Is Liberation: Zines of Resistance." According to the festival's website, the workshop "will outline different ways that art and illustrations are being used in current political movements as well as offer the opportunity for participants to create their own zine." A quick glance at the festival's attendees reveals a vibrant creative community, and one with a lot to say. Mendoza's certainly isn't the only powerful, community-minded, issue-based zine being produced locally. In Provo, Sara Faulkner is busy creating, curating and compiling Pillars of Salt, with a focus on intersectional feminism, including stories that overlap with other social equality issues and identities including race, class, ethnicity, religion and sexual orientation. Faulkner works hard to keep her zine bright and colorful, something that people would be excited to pick up, because on the inside, Pillars of Salt can get pretty deep, personal and sometimes scary. It's a zine that creates a space for healthy community dialogue, a place where people can be honest, raising issues like suicide, which Faulkner considers a serious problem in Utah County but one that most people would rather ignore. Zines might be small and powerful, but they can also be silly and entertaining. The goal for Ricky Vigil is to take the most lighthearted approach. Five years ago, he created an autobiographical comic/zine called Super Cool & Stuff, which started out as a simple way to entertain his friends. "I've liked comics since I was a kid," he says. "When I was older, I got into indie comics like American Elf and punk rock comics like Snake Pit. I was reading them and thought, I could do that, so I made a comic every day for about nine months and posted them online. The response from friends was really good and that's how it started." Life moved on for Vigil, and after a few issues of Super Cool & Stuff, the comic/zine fell by the wayside. Grid Zine Fest, he says, has given him a reason to start it up again. Now, there are some new characters in Vigil's cartoon panels, including his wife. He hasn't posted any online yet; he says he might get around to it. But for now, he's pretty busy getting some hard copies ready to take to the festival. "Zines are handmade passion projects," he muses. "Having something physical that you made is really cool. Instagram is cool, too, but it's different having something in your hand that someone made."